What a night… there is nothing like listening to a strong wind in an old house. I never cease to be amazed by how much noise the house makes in the wind. The barn is even worse. I don’t really like working in the barn when it is this windy. Luckily I have project work to do inside the house. Over the weekend, Susanna and I moved the cherry bookshelves from the workshop to the basement to be finished. 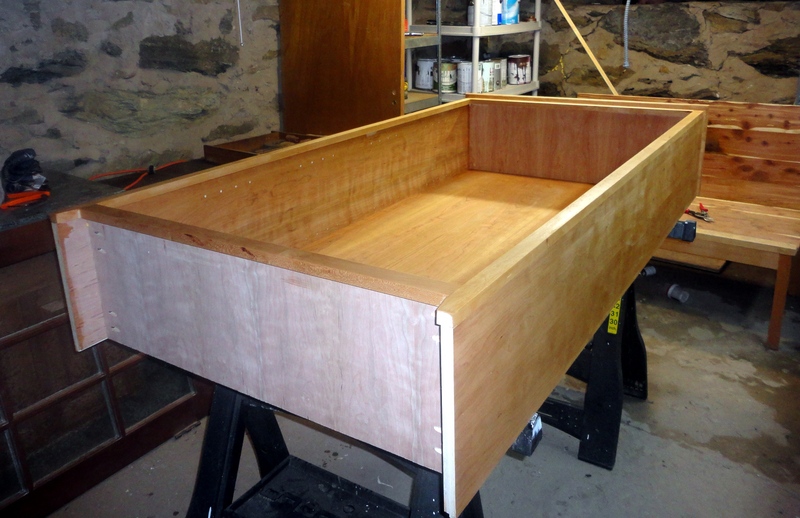 I spent a couple of evenings this week sanding the carcase to prepare it for the finish. 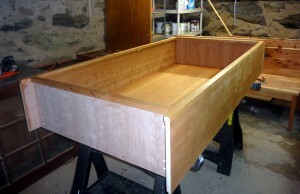 The plan is to do one coat of shellac and then spray the water-based top coat. Tonight I applied a single coat of shellac. I probably won’t be able to spray the shelves until this weekend. I have two of the four shelves completely finished. The last two shelves will be finished after I am done with the case. There isn’t enough room in the finishing room to manage the case and shelves at the same time (yes I do need to get rid of things).